World's Finest Retractable Screen System ! 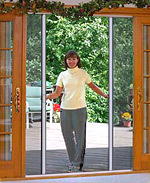 The Retractable Way To Screen Any Door Or Window ! Retractable Screens are the perfect solution. Our screens compliment any existing decor and provide complete protection against flying insects and other airborne pests. The sun-control fabrics also provide a great solution to help reduce the fading of interior furnishings while filtering out uncomfortable heat and glare. Whether for insect or solar control, we have the answers that offer you a view to the outside. All of our retractable screens are made to stand the test of time. Each product is made using only the finest materials for the best fit and finish in the industry. The aluminum extruded frame is powder coated producing the best appearance possible with a long-lasting, easy to clean surface and the screen is made to do what screens are intended to do.... keep bugs out. A thick insect piling on the open ends along with a full-length rust-proof magnetic seal ensures that while the screen is closed the bugs stay out. We have also made installation and maintenance easy. Our systems are designed to fit almost any size door and are adaptable to almost any custom size in mere moments.... even garage door openings. A retractable screen that offers all the advantages of a concealed screen system. 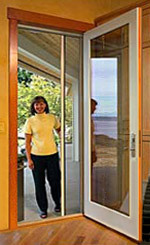 The screen frame virtually disappears when not in use because it is uniquely designed to mount in the recess area of most doors and windows. They are easy to use regardless of application - French, Slider or Single door. The optional built-in hydraulic dampener allows for easy, smooth retraction to eliminate any slamming if the screen is accidentally released. Our retractable screens are versatile and designed to rest in the recess area of any door where they virtually disappear (may also be surface mounted). They are unobtrusive, easy to use and install in mere moments. A one-year warranty on the screen and a lifetime warranty on all non-screen parts. Retractable Screens that virtually disappear when not in use!. A unique screen system that is small and specifically designed to rest on the surface or in the recess area of any door where they remain virtually unnoticeable. Smooth, easy retraction, no slamming of the screen if accidentally released. Double doors with two retractable Screens require two dampeners. Protects bottom rail and provides a smoother threshold transition. Available in bronze or mill finish. Screen simply glides within the rails. No wheels or rollers to replace or lubricate. Retractable screens can be easily cut to fit and installed on site by an accomplished Do-It-Yourselfer. To order a pre-cut and partially assembled Glide Screen Kit please contact one of our customer service representatives at 1-855-568-8586. This option includes assembly of the screen at our factory and will minimize the on-site installation process. Single Door - Retractable Screen Kit 36" x 84"
Single Door - Retractable Screen Kit 36" x 96"
Single Door - Retractable Screen Kit 48" x 84"
Single Door - Retractable Screen Kit 48" x 96"
Single Door - Retractable Screen Kit 60" x 84"
Single Door - Retractable Screen Kit 60" x 96"
Double Door - Retractable Screen Kit 48" x 84"
Double Door - Retractable Screen Kit 48" x 96"
Double Door - Retractable Screen Kit 60" x 84"
Double Door - Retractable Screen Kit 60" x 96"
Double Door - Retractable Screen Kit 72" x 84"
Double Door - Retractable Screen Kit 72" x 96"
Protects the Glide Screen track and provides an efficient transition. The overall width is 2-1/8". The width of the exposed sill guard (ramp) is 1-1/4". They are generally installed for hinge door applications and rarely used for sliding doors. The Glide Screen "Quick Fit Kits" provide a greater part of the assembly with our prefabricated parts to insure an uncomplicated, trouble-free, and straightforward installation process. We have added this optional kit to enable quicker and easier assembly for all of our Retractable Screens. A Retractable Screen kit that is the most practical and versatile system on the market today. Generally, the system is comprised of a screen material (normally fiberglass insect screening) fixed to an aluminum center tube and to an aluminum sliding bar with which to pull the screen out of the housing. The screen is normally tensioned by a spring mechanism (hydraulic dampeners are also available) and so, upon release the slider bar and the screen returns to the housing, winding itself back onto the center tube ready for use again - safely hidden out of sight and harm's way. What makes our product unique lies in the heart of each system; the center tube and the screen. Both are engineered to perfection. The design of the extruded aluminum tube is based on years of experience. The fiberglass screen is specifically engineered for use in our screen systems and is the result of almost a decade of development by Phifer Wire Products, the world's largest weaver of insect screening. They are tough and designed to expand upon impact or accidental bumps...then return to normal position. This will prevent costly repairs and provide lasting use. 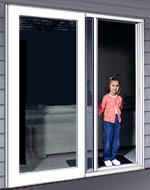 of our retractable screen door kits. I've forwarded you the email with name and phone number of the e-store I finally chose for my invisible screen. Also his measuring guide - It was THE Best Price - it's a great product and great access for installation instructions. What I like best besides the excellent customer service from Dave, is the diameter of the cylinders that hold the screen - only about 1 1/2" so it looks great installed.